Richard Kuo engaging 3700 students and staff at the Fountain Valley HS kindness assembly. Richard understands how critical of a time it is for students to develop healthy self-esteem that they can use for the rest of their lives. Through this presentation, Richard will captivate students with humorous personal stories regarding his low self-esteem growing up, educate them on how to love themselves and others, and empower them to create their legacies. 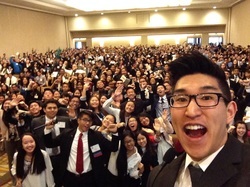 Richard Kuo captivating 1000+ student leaders at the annual Key Club Cali-Nev-Ha District Convention. Richard grew up heavily involved with leadership roles and conferences, so he thoroughly understands the obstacles getting in the way of leaders becoming the best they could be. This presentation is designed to address the most important elements that separate effective leaders from leaders and empower students to start taking action today! Want to see some of Richard's videos? Questions or interested in booking? ​Email Richard@RichardKuo.com or use the contact form below. Richard Kuo © 2018. All Rights Reserved. Free Guide: "Top 10 Ways to Engage Your Students"!